There's a book coming out in a few days that I think will make excellent Halloween reading: The Last Man Anthology from Sword & Saga Press. 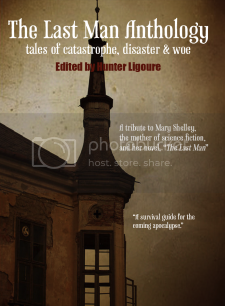 The Last Man Anthology takes inspiration from one of my very favorite novels, Mary Wollstonecraft Shelley’s The Last Man, and showcases short stories and poems that build on the theme of finality. Here's the official description: "From experiencing the last snowmelt to taking part of the last day on Earth, The Last Man Anthology propels catastrophic literature into the twenty-first century while staying true to Shelley’s timeless themes of chaos and isolation. How would it feel to know you were experiencing your last day on Earth? What would the end of the world look like to the Greek gods, the last bookstore owner, or the last philosopher? Contributors include veteran writers Ray Bradbury, C.J. Cherryh, and Barry N. Malzberg, along with such classic sci-fi authors as H.G. Wells, Edgar Allan Poe, and Jack London, and an assortment of contemporary writers from four continents." 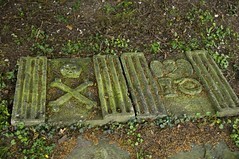 Text of the Day: Today's text is the short story "The Corpse on the Grating" by Hugh B. Cave (1910-2004). Enjoy! Hey there! :) I surely did get your wonderful card - I loved it! It's on the refrigerator right now. Thank you so much. Hugs and Happy Halloweenings to you!